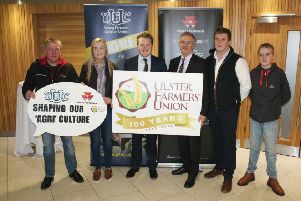 The Young Farmers’ Clubs of Ulster annual ten pin bowling competition sponsored by Northern Counties Co-Operative Enterprises Ltd (NCCE) took place on Thursday, January 17th. Teams of five players competed in two locations; Dundonald Ice Bowl (for Counties Antrim, Down and Armagh) and Brunswick Moviebowl in Londonderry (for Counties Londonderry, Fermanagh and Tyrone) on the same night. Between the two venues, 42 teams competed in the popular event. All teams played two games and the overall team score from both games are added together to find the overall winner. 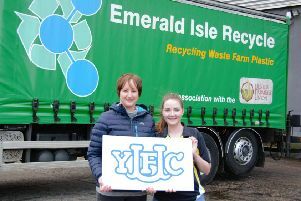 Spa Young Farmers’ Club were crowned the winners for the second year running. The team was made up of Hannah Shaw, Matthew Patterson, Nicola Edgar, James Ferguson and James Carlisle who picked up the trophy from YFCU president James Speers. The ten pin bowling tournament is one of the most popular events in the YFCU calendar, giving clubs a chance to get together, compete and socialise in a relaxed environment. The YFCU would like to thank sponsors Northern Counties Co-Operative Enterprises for their support of the competition, which helps contribute to the ongoing personal development of YFCU members. Louise Conn, NCCE general manager, said: “NCCE are absolutely delighted to be a continued sponsor of the YFCU ten pin bowling competition. “We are a farmers owned co-operative based in Swatragh, Co Derry and are a premier provider of farming services. “On site we have a Farmware Store, the Swatragh Livestock Mart, an indoor auction centre and a training and information centre.